Jenn Lyons’ The Ruin of Kings boldly offers a debut epic fantasy novel with a wide canvas focused on an unwittingly pivotal figure in a complex and multifaceted world. This is Jenn Lyon’s epic fantasy novel, The Ruin of Kings. The novel’s structure, whose provenance is not clear at the beginning and could have used a tad more clarification, settles down into alternating chapters. Lyons uses voice and point of view and tense here quite effectively to tell two narratives at key portions of his life in flashback with Kihirin already imprisoned by the antagonist. It is an effective variant on “How did I get into this mess?” to interest the reader from the get-go and also provide clues to events that unfold in the narrative. From Kihirin himself, we get the story of him being sold as a slave, and subsequent dealings with a dragon, Gods and more on his way back to the Capital. This is done in a sharp first person perspective. This is a Kihrin at the height of his powers, and while he is still in a sink-or-swim situation, he has some competencies and experience under his belt. In the other chapters, we get Talon, one of his jailors, telling Kihrin his own story from an earlier point--the path that eventually leads to that slave block. That story, done in a third person perspective, has the real meat and potatoes of the classic rags to riches story, where Kihrin discovers and is discovered to be far more than a thief working in a brothel, and is in fact, of noble blood origins. His reluctance and resistance to this fate is the major tension of those chapters, as it makes it absolutely clear that being a secret prince of House D’Mon is not exactly a fairytale revelation. Kihrin is skeptical of this from the first, and with good reason. After all, the reader knows that Kihrin is going to wind up on a slave block. There’s even more to unfold here than just this. The recitations of the twin narratives is itself being collected, and being commented on by a third party. The beginning makes it clear that the story is being documented for posterity by one Thrurvishar D’Lorus.. In addition, the novel has footnotes by Thruvishar, who has all sorts of opinions on what Kihrin and his jailor have to say about each other. The fact that the annotator himself enters the events of the narrative gives this a strange meta-feel, when he comments on actions that Kihrin witnesses. It’s a lovely literary conceit. The only issue I have with it is that e-readers, in their current form, do not handle footnotes well. The footnotes are not plot-essential but they do enrich the narrative and the world that the author creates, and their trangressive, disruptive nature to a narrative enriches the story. The Ruin of Kings is a book best read in paper, then, with the Kindle edition a paler shadow of it. With these twin narrative threads, the author effectively avoids the pitfalls of a novel that is one single shot flashback or just a straightforward recitation of events. Seeing Kihrin in two time frames gives us a chance to get to know him at two key periods in his life, when he is completely ignorant of the dealings of the Noble Houses, and then later, when he has enough power and self-knowledge to know what he wants to do with that power. Or, more importantly, what he *needs* to do. It’s a rich world that Kihrin inhabits as well, with some nice twists on the usual tropes and ideas. The Emperor is not as one might expect the head of one of the noble families, but rather could be anyone who manages to win the crown in a battle royale that is setup the moment an Emperor is killed (they have functional immortality otherwise). This avoids any easy possibilities of barracks Emperors or assassins declaring themselves Emperor after killing the old one. This is not to say that there are potential loopholes in this setup, but it does mean that the noble Houses are far more interested in consolidating their temporal power over their spheres of influence than trying to grab the crown. In straight up Epic fantasy fashion, there is plenty of magic, magical creatures and all of it of various types. Elder race ruins (which become plot relevant), Dragons, Shapeshifters, Demons, magical spells and research, powerful artifacts. Magic is a powerful tool in Lyons’ world, but she manages to balance the power of magic with other skills, neatly sidestepping the trap of some epic fantasies where the magicians are in the end the only characters that matter when the stakes are on the line. The novel makes me think of a 2018 novel, Alexandra Rowland’s A Conspiracy of Truths, with it’s playing with narrative, voice, information control and point of view. Like that novel, I am intensely curious as to where the author goes from here. In addition to being curious about the character and the state of the world at the end of the book, the narrative frame used here so ingeniously would be difficult to pull off again in succession. Where the author goes in her evolution and growth is something I am eager to know about. 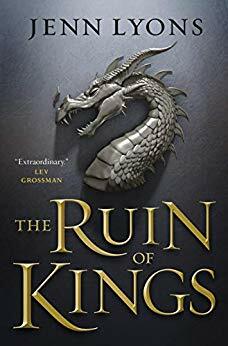 For readers who want an off-ramp, however, The Ruin of Kings does come to a satisfactory close, with an ending that does indicate that it is a beginning to a longer story, it would be relatively easy to close the book on the series here if they wanted to one-and-done. I appreciate that in a book, especially the beginning of a series, because time IS finite and one finds it difficult to continue every series that one comes across, no matter how good the first volume is. For me, though, I am well invested in Kihrin’s story enough to want to see where the author goes next in this milieu.